OMG Posters! » Archive "I Kind of Always Thought You'd Be Around" Art Print by Justin Santora - OMG Posters! Wow, Chicago music enthusiasts should be into this one. 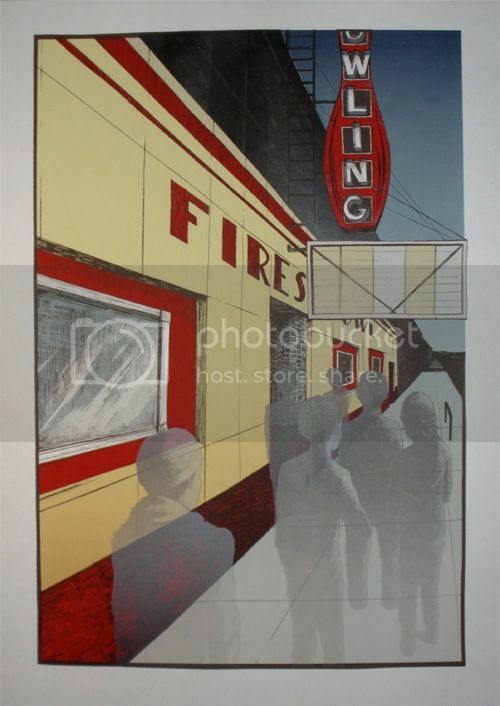 Justin Santora’s nod to the Fireside Bowl (which no longer holds shows) is a 17″ x 23″ ten color screenprint, has an edition of 35, and is $30 shipped. Visit the Gigposters.com Classifieds. I saw some of the greatest shows at that joint. I think I spent most of the mid-late 90’s there actually. Justin is really putting out great art these days. I bought this one right away. Oh, how I miss going to shows there. um…can someone tell me how you actually buy this print? Spent a ton of time there myself…and would definitely like to support the artist who made this.